It is mending month at Craft Magazine and I have used that as an excuse to get all my mending done at home. Kids can really tear through their clothes and while I try to fix simple things I usually don’t go all out with big tears and wardrobe malfunctions. However, since the economy is pretty cruddy, I thought I would brush off my sewing skills and start really fixing everything I possibly can. Sewing the patch on my jeans. I used a denim scrap that I saved from shortening another pair for my daughter. 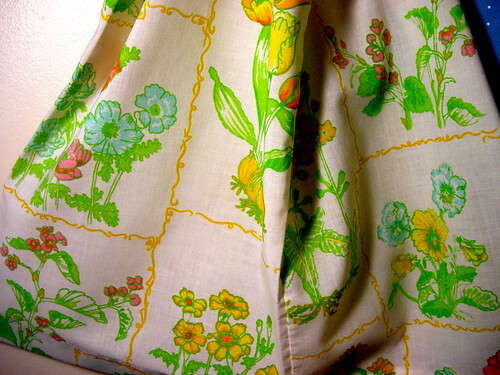 This tutorial will show you how to dress up a plain white flour sack dish cloth. I picked up four cloths at Deal’s scoring each two pack for only a dollar. For the embellishments I used fabric paint and fabric from Hobby Lobby. 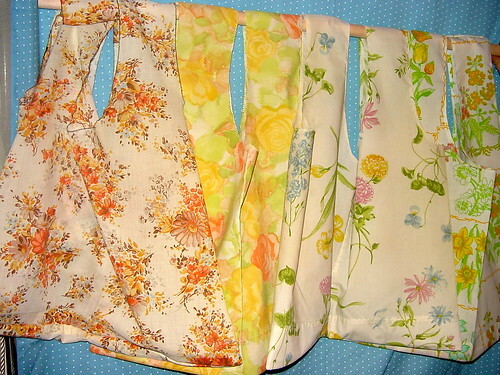 The fabric cost a few dollars because I didn’t need very much of it and the fabric paint was just a dollar each. I am using orange and blue paint and the paint is a matte finish as I didn’t think shiny would be the best in the kitchen. I am using fabric in cordinating colors – one striped and one polka dotted. This will give me to sets of cordinating (but not matchy matchy) towels to give as gifts. First you need to measure and cut your fabric. To figure out how long I needed the fabric to be I ironed then layed out the towels to find the length. Add 1/2 inch to this measurement for folding over the raw edges of your contrasting fabric. After you know how long your fabric stripe is going to be you need to figure out how wide. I made mine 4 inches wide when finished so do make it the same measure 4 1/2 inches so that you have enough fabric to fold over the raw edges. When sewing, your iron is your best friend. 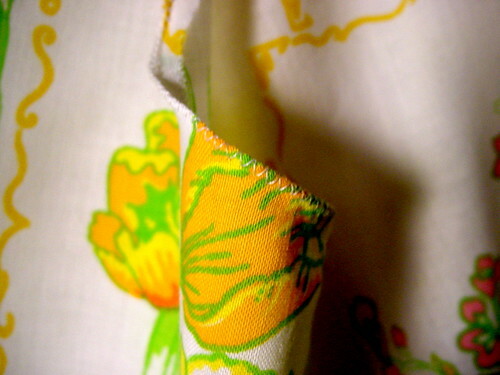 Once you have cut out your fabric, iron under the raw edges on the long sides – 1/4 inch on each side. When you have finished that, fold under and iron the raw edges from the short sides. Layout your flour sack towel and lay your stripe out on it. Get it positioned where you want it to be then pin it to the towel. Top stitch the fabric to the towel. I did horizontal stitching only and did not go vertically up the sides. When you are done, trim your threads and repeat with the next towel. These towels are 100% prettier with the fabric added but I wanted a little more interest. I am using matte fabric paint – blue and orange for these – to stamp birds just above the added fabric. To make the stamps I used the printables from Craft Magazine and two sponges. I traced the pattern of one of the birds onto a sponge and then used an Exacto knife to cut it out. I squirted some paint onto a paper plate, dipped the sponge stamp into it and then placed it onto the towel. Make sure you cover the surface under your towel where you will be painting. I used wax paper for easy cleanup. Sometimes the sponge leaves the paint with gaps or holes on the impression so I just used a paint brush to smooth out bumps, globs, and imprefections. When you have added all the painted details you want to your towel, allow to dry as the paint instructions indicate. When it has cured you will have a unique and impressive gift for family and friends, or you can keep them for your own kitchen! If you are feeling extra crafty, you can use any extra or left over paint to stamp paper to make cordinating custom gift wrap! The Thr33 Lies from the Modesty Writers Guild Blog – A great post (ignore the lack of capitalization and other things of that sort that make the eyes scream). This post talks about the three lies that one needs to overcome in this world for a full life. I loved it so much I printed it and put it in my project book so I see it every day. The Tiffin Lunchbox at Stephmodo – Stephmodo discovered the two tiered Tiffin lunchbox at World Market for a measly $8. It is gorgeous, original, practical and reminds me of the little lunch pails on Little House on the Prairie all shiny and modernized. Fantastic! DIY Yourself Washing Detergent Saves You Cash – Lifehacker posted an article on making homemade laundry soap. Directing readers over to TipNut for the recipes – not only is there the liquid recipes, but also the powder recipes. Ten of them to be exact! Just in time to make a batch. My Ecologically Correct Move (Boing Boing) – If you are in California (only locations so far) the service RentAGreenBox.com will deliver recycled plastic moving containers for you to pack and move the next time you relocate then pick them up when you are done. We are still finding boxes of stuff around from our last move, how nice it would have been to help the purge if I HAD to unpack it to give back the containers AND didn’t end up trying to find someone who needed the crummy cardboard boxes so I didn’t have to toss them in a landfill. How to Make a Super-Simple Recycled Quilt – This post at Craft Stylist shows you how to upcycle old blankets and sheets from the thiftstore (or from around the house) to whip out a warm and easy quilt in no time flat. I think this would be a great way to make blankets for kids beds in trendy themes that they seem to outgrow too fast. The character themed designs seem to cost a fortune and they get tired of them quickly. Using this technique you could repurpose decorated sheets for a warm coverlet that would dress up their room. This week’s Works for Me Wednesday is the Charlie Bag. I sew under the name linuxchic at BurdaStyle and for Christmas decided to make Charlie Bags for my kids’ teachers and my brother’s girlfriend. They are quick and let you shop for your necessities in style. If you have a large family, you can never have enough shopping bags and frankly, I don’t like buying the reusable ones that are store branded. They are cheaply made and just plain ugly. You can use any fabric you have laying around (although cotton, canvas, or muslin would work best) and follow this pattern at BurdaStyle. 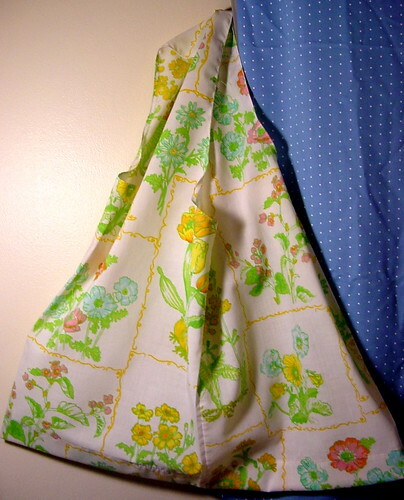 I found this HowTo posted on upcycling pillowcases into Charlie bags and used it for my guide. I had some great old pillowcases I picked up at a second hand store just waiting to be used and thought this project would be ideal for them. I finished the edges with a simple overlock stitch on my old Singer to prevent raveling. All in all it only took an hour per bag and as I whipped them out I got even quicker. These bags are roomy and fold up into a tiny little package to toss into your purse or diaper bag to keep handy. Using thread I had already and any old pillowcase, you can have great shopping bags for little to no money and they look great!